Having relocated to Southbank earlier this year, Downies have been settling in nicely and attracting some local media attention. Check out the recent feature article in Southbank Local News’ August issue below! One of the world's great commercial powers in the 17th and 18th centuries – so powerful it operated on a quasi-governmental basis – the Dutch East India Company (Vereenigde Oostindische Compagnie, VOC) was a key player in the Asian spice trade. Considered by many to be the world's first multinational corporation, the company dispatched nearly 5,000 ships to Asia between 1602 and 1796. Destined to be the stage for an epic tale of mutiny, mayhem and murder, one of those ships was the Batavia. Built in Amsterdam in 1627-28, the Batavia was purchased by VOC to transport personnel, goods and coinage between company HQ in the Netherlands and Batavia (modern Jakarta) on the island of Java. Extremely well armed, with 24 cast-iron cannons united with a number of bronze guns, the ship had the capacity to carry over 300 people. The Batavia set sail on 27 October 1628 on her maiden voyage. It would also be her last. There were officially 341 people on board the Batavia when she left the Netherlands, including more than 200 crew and employees of the VOC, 100 or so soldiers and a small group of civilians. The commander of the vessel was not the captain, but the VOC senior merchant, Francisco Pelsaert, with the actual captain, Adrian Jacobsz, being Pelsaert's 2nd in command. This was VOC policy, and was not well received by some skippers employed by the company. Pelsaert and Jacobsz had a history of hostility in any event, having clashed on the homeward voyage of the Dordrecht in 1627. Loaded with twelve chests of silver coins, as well as antiquities belonging to the artist Peter Paul Rubens, the Batavia sailed with several other ships on the voyage to Java. The fleet was not to stay together for long, however, with a violent storm separating the ships soon after leaving port. Progressing well, the ships made the Cape of Good Hope a month ahead of time. Whilst in what would one day become Cape Town, South Africa, Pelsaert gave Jacobsz a public dressing down following a drinking spree, and the animosity between the two men intensified significantly as a result. After setting sail again, Pelsaert fell ill, and in his absence, discipline was eroded and a plot hatched by Jacobsz to take over the ship. His plan was to take over the heavily armed Batavia, killing those he didn’t need, and use the ship to hunt down other VOC vessels – whilst naturally taking possession of the huge amount of silver coins on board. His chief collaborator in this murky endeavour was one Jeronimus Cornelisz. A bankrupt pharmacist on the run from Dutch authorities due to his heretical beliefs, and VOC 'under merchant' on this particular voyage, Cornelisz also turned out to be a psychopath. As the vessel neared the coast of Western Australia, before her northward passage to Java, the mutiny was about to be put into action – when disaster struck. Inaccurate longitudinal measurements often placed Dutch East India Company vessels too close to rocks off the coast of what they called Groot Zuydtlandt – the Great Southern Land. There were several VOC shipwrecks off the Western Australia coast, with Batavia undoubtedly the most famous. In large part, that fame is due to the appalling tale of horror that unfolded after she struck a reef in the Abrolhos Islands on 4 June 1629. 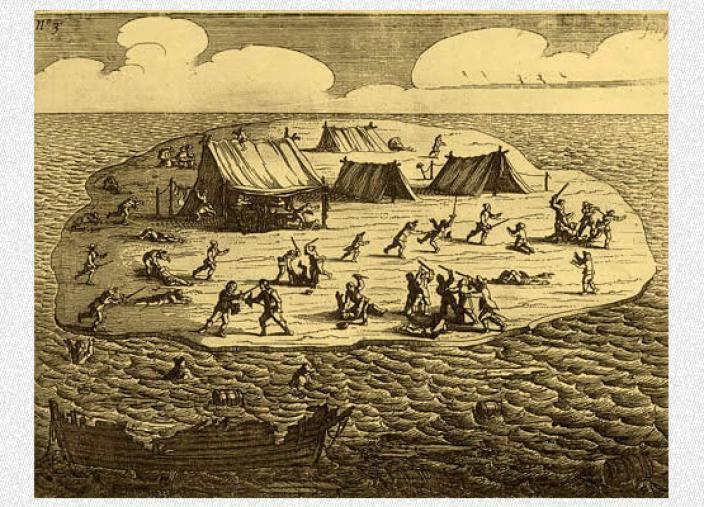 Of the 300+ people on board, around 40 drowned after the Batavia hit the reef, with the vast majority of passengers and crew making it to shore. Most were ferried to an island that became known as 'Batavia's Graveyard', with Pelsaert, the skipper Jacobsz, senior officers and some passengers on a nearby island. After failing to find water on the mainland, Pelsaert decided that the only option was to head for Batavia in Java in one of the ship's longboats to seek help. Those left behind were so distraught at what they believed to be their desertion by the commander, they dubbed the nearby isle, Traitor Island – a name it still bears today. Amazingly, in one of the greatest feats of navigation in an open boat, the group successfully traversed over 3,000km, making it to Java in 33 days. Seeking to save the survivors of the shipwreck, and reclaim the cargo, Pelsaert's return voyage, in the VOC ship the Sardam, took 63 days. In the 90 days since the commander had left the forlorn survivors of the shipwreck, much had changed. As undermerchant, Jeronimus Cornelisz had been left in charge when Pelsaert had set off to Java. Whether it was because he feared he would be implicated in the mutiny plot, or whether it was because he was on the run due to his radical religious beliefs, Cornelisz determined to hijack the first passing ship. He realised, however, that other survivors from the shipwreck, including the contingent of armed soldiers, may well oppose his plan. Commandeering the weapons and food supplies, and having recruited about 40 men as unscrupulous as himself, Cornelisz began thinning out the numbers. Cornelisz began by sending parties out to nearby islands. He told the members of those parties that they were vital in the mission to find food and fresh water sources, but in reality acted in the hope that they would find nothing and die. As for the poor souls that remained on the main island with Cornelisz, they would face a more immediate threat. Looking to eradicate those who may oppose him, and those who would be a drain on limited resources, Cornelisz manipulated those he had recruited to kill members of the marooned party. Initially justifying the killings by suggesting that crimes such as theft had been committed, Cornelisz and his henchmen soon became blasé and indiscriminate in the murderous rampage, with men, women and children all fair game. The merest excuse for murder was all that was required. Allegedly, some ended up killing out of boredom. Ultimately, more than 100 of the shipwreck survivors were slain. Cornelisz’ reign of terror was soon to end, however. Before the killings began, he had dispatched a group of soldiers led by Wiebbe Hayes to another island in hope that they would find no water or food and die. They had been told to signal Cornelisz should they find resources, and duly did so when they discovered their island could provide both food and water. The soldiers’ survival surprised and concerned Cornelisz greatly, and he at first attempted to persuade Hayes to join forces. The soldiers refused, so Cornelisz sent a force to eliminate them. Even though the soldiers did not have any weapons, they defeated Cornelisz’ men. Cornelisz then personally led a second attack with five of his men, and they were duly overpowered. Cornelisz was made captive, with his five accomplices summarily executed by the soldiers. It was around this time that the commander of Batavia, Francisco Pelsaert, finally returned to the site of the shipwreck, more than three months after ‘deserting’ his charges. Wiebbe Hayes was first to address the senior merchant, describing exactly what Cornelisz had done. Pelsaert interrogated the mutineers, discovered the extent of the atrocities, and instantly set about summary justice. On the 2nd of October, 1629, the chief culprits were put to death. Each man had his right hand cut off before hanged at the neck until dead – except Cornelisz, who had both hands severed before swinging from the rope. Two mutineers were left marooned on the mainland, with the rest transported back to Java for trial. These so-called ‘lesser offenders’ faced a grim, short future. Flogged, keelhauled, and dropped from the yard arm on the journey to Java as some sort of interim punishment, most were executed upon their arrival. After all the executions had taken place, and the number of those murdered by Cornelisz accounted for, only 116 people of the more than 300 that had left the Netherlands aboard the Batavia on her maiden voyage were still alive. Of the survivors, different fates awaited. Wiebbe Hayes and his soldiers were rewarded for their efforts in resisting the murderous rampage of Cornelisz, with Hayes receiving successive promotions. The captain, Adrian Jacobsz, was tortured having been implicated in the original mutiny plot, but would not yield. His fate is unknown, although many believe he died in prison in Java. As for the commander of the ill-fated mission, Francisco Pelsaert, he was punished for his failure to maintain discipline on the voyage, had his financial assets seized, and died within a year, a broken man. One of the earliest points-of-contact between Europe and the Australian continent, the tale of the Batavia, and of the mutiny, mayhem and murder that followed her shipwreck, form a crucial part of Australian history. On Friday, May 29 Downies held a special event to officially launch their new retail store at Southgate on the banks of the picturesque Yarra River in Melbourne's CBD. The event was attended by around 30 people, with clients, friends of Downies Coins and Downies staff in attendance. Ken Downie was also on hand to host the launch of the store which has been recently refurbished after relocating from the historic Block Arcade, where it resided for the past 21 years. As part of the launch party celebrations, the announcement of a winner for the Lucky Coin Offer was made - and while the $20,000 major prize did not get drawn, Mr C Hill of Woodbine, NSW did manage to pick up a $500 prize. Guests were also given exclusive pre-release access to the latest in the Deadly & Dangerous Silver Coin Series dedicated to the vicious Bull Ant. On hand to capture the event was a videographer who put together a terrific video package about the store, with some of our valued clients talking about what it means to be a collector, as well as sharing their opinions on the new store. 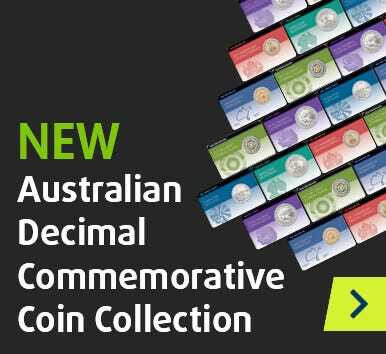 Also interviewed were Downies CEO Ken Downie and Senior Numismatist David Jobson, who is based at our Sydney Town Hall store but attended the event as part of a visit to Melbourne to meet with customers.